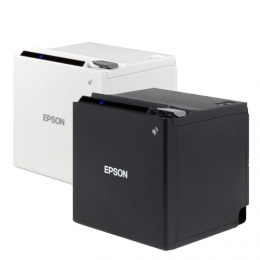 The compact receipt printer Epson TM-m30 not only brings the proven print technology of a leading manufacturer with it, it also offers full compatibility with nearly every tablet, smartphone or stationary POS system. The latter is made possible by Epsons platform-independent ePOS XML technology. This supports printing from all mobile and stationary devices via a web browser - entirely independent of the platform, perfect for the future-oriented utilization in hospitality, retail or catering. Quickly prints sales slips and receipts with up to 200 mm/sec. To ensure for simple integration, the TM-m30 comes equipped standard with a dual interface USB and Ethernet. The ePOS receipt printer offers an even higher degree of connectivity with an optional Wi-Fi dongle or integrated Bluetooth 3.0. Because of its compact square housing 127 x 127 x127 mm the TM-m30 may quickly be switched from top to front load output, and thus makes under-the-counter placement possible. Print results are produced rapidly up to 200 mm per second and are always crisp and sharp, thanks to the print resolution of 8 dots/mm 203 dpi.